I had one of my biggest thrills as a coach today as Phil Zajicek beat Lance and Levi in the final stage of the Tour of the Gila. I've been working with Phil since the fall of '08 and it has been a rough year so far, but today made it all worth while for sure. Don't get me wrong. Heck I like Lance and Levi and have even worked with Levi (and his amazing coach Max Testa) to help him set up his TrainingPeaks charts (see story about Levi and Scott Nydam here). But when you work with a guy closely on a daily basis you'd like to see him beat the world's best. It is a rare occassion that it happens so today was special for sure. Phil has had a rough year so far. It started out with him breaking his wrist in the Tour of CA then he crashed hard again at the San Dimas stage race just prior to Redlands. Since Redlands Phil has been trying to stay focused and train hard in the mountains around Boulder. Things seemed to turn around a few weeks ago when Phil won the Air Force Academy road race in CO Springs. 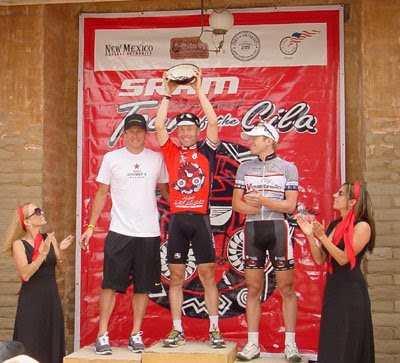 He then went on to finish 2nd overall in La Vuelta de Bisbee, where he won the time trial. The Tour of the Gila didn't start out amazing as he finished @13th in stage 1 at the top of the Mogollon climb. But things got back on track with an incredible TT result. Phil finished 4th only 13 seconds behind Lance which moved him up to 5th overall. Phil surfed the crit and luckily played it safe (way too many crashes it sounds like in the final laps). When I spoke to Phil after the crit he was fired up and more than ready to rock out on the Gila Monster climb (the main Cat 1 climb in the final stage). Things went to plan and he came through with flying colors. Way to go Phil! He finished 3rd overall with only a couple of the world's best riders on the higher steps. Phil's PMC was -2 TSB heading into the Gila with a CTL of over 120. He had been hitting top-10 CP5 and CP20 values in the last few weeks as well which is always a great sign. I saw that you tweeted today about motorpacing. I've been using my scooter for training the last 2 years and am always looking for new workouts to do behind it. My NP is always pretty low compared to how trashed I feel after these sessions. Could you give a description of the workouts you do behind the moto? Thx. Thanks for writing. My motorpacing workout yesterday (see http://www.trainingpeaks.com/sw/XNBXD4KX6UKKEDWLCKDPN34ZKQ ) was designed to focus on leg speed and speed changes. I really wasn't focused on really high anaerobic work since this was the second day of a three-day block for me. I've found that in the last few races that I had problems racing with a higher cadence and I wish to change this as a prepare for the Tour de Nez and Nevada City Classic in late June. My goal for the motorpacing session was to ideally produce a normalized power value of around 330w (my FTP is 345w I estimate). I've recovered well but again I didn't push the pace too much and was well within my limits most of the time. if you are feeling really sore and fatigued after your motorpacing sessions that may not be a bad thing. It all depends on your goals for the workout. I've also done motorpacing sessions where I was very tired and sore the next day. This is usually do to the pace changes, high cadence and massive amounts of time spend anaerobic. Again my goal yesterday was to focus on being below my FTP for the majority of the workout and have a high cadence (I averaged 97rpm). I also tried a gently rolling course and tried to stay seated over the climbs in order to work on my force while seated.